The feeling of alienation so prevalent in their preceding albums diminished, the musical textures resonating far and beyond their humble origins. 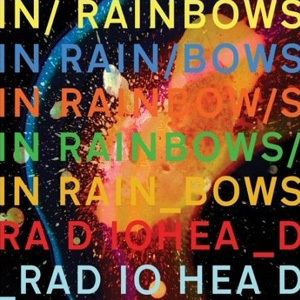 On October 10, 2007, Radiohead shocked the world (well a few newspaper journalists with a fondness for hyperbole) by self-releasing their seventh full-length album via digital download on a pay-what-you-want basis. No record companies, no middlemen, no crap. Aside from the press frenzy of, "Is This The End Of The Music Industry As We Know It?" (probably), and the priceless yet never-to-be-released market research that could answer the most pressing question of the digital age, "How much are people really willing to pay for a download? ", what have we got for our money? Retaining traces of the electro-sweat of 'Amnesiac' and 'Kid A' with stripped-down acoustics, heavy bass and percussion that ranges from pulsing electro-dub to broken jazz fusion, this is Radiohead at their most naked. From the fuzzy guitars of 'Bodysnatchers' to the delicate arpeggios of 'Weird Fishes' and the dirty basslines of 'All I Need', Thom Yorke's potent vocals weave together the stylistically diverse tracks like an existential needle and thread; the feeling of alienation so prevalent in their preceding albums diminished, the musical textures resonating far and beyond their humble origins. This album will get you. Even if you don't want to be got.